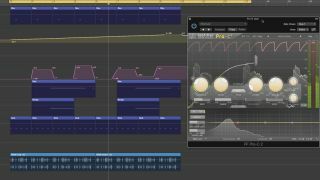 Given how spectacular many of today's cutting-edge plugin effects can be on their own, imagine the sonic fireworks that can result from cascading multiple processors into each other. In this walkthrough we'll show you how to do set up just such a scheme, forwarding effects outputs on to each other via a chain of auxiliary sends. For more on the subject of atmosphere effects processing, pick up the April edition of Future Music. Step 1: We’ve got a down-tempo groove playing, made up from a number of sampled sources. It’s the rimshot sound on beat 2 we’re looking to process, taking the opportunity provided by it only playing a single hit per bar to fill in the space between hits. Here’s the groove without any processing. Step 2: Next we set up a first reverb solution for the rim sample using FabFilter’s Pro-R Reverb. We choose a long decay time alongside a dark overall character. Pro-R lets you clock pre-delay time to tempo, so we select an 1/8th note here. Step 3: This reverb sounds a little predictable after a while, so we set up an auxiliary send from the Pro-R’s auxiliary channel, so that the reverb can be further processed by another effect. We set up Waves’ H-Delay, with a ping-pong treatment, to bounce smeared delay taps across the stereo field. Step 4: After the H-Delay, we place the UAD Moog Filter plugin, using a preset called Stereo Motion as a foundation. This rotates the cutoff point of the filter so that it’s low on the left while being high on the right, via LFO movement. Step 5: We send this second auxiliary to a third one. We add the ValhallaShimmer plug-in to produce a super high, ultra-wide reverb treatment with pitchshifting to create a slightly ghostly, unreal treatment. We can vary the volume of all of these auxiliary treatments simply by balancing the Mixer’s faders. Step 6: However, the whole effects layer is now dense and predictable. We automate the sends from one auxiliary to the next, so that the balance of each hit is always different. Lastly, we place a sidechained FabFilter Pro-C 2 compressor at the end of each auxiliary channel strip and sidechain these from the kick drum.